The Laughing Dog: Let Them Eat Cake! The approach is to put a couple of stones in the bottom of a pot to hold a silicone muffin cup off the bottom, add water to the pot, put the batter in the cup, place the cup on the stones, put the top on, put the pot on a stove. When the water boils, the cup is enveloped in steam. Eventually, the batter rises, and when the cake passes the toothpick test, it's done. Turn it out and enjoy. I had to give this a try. 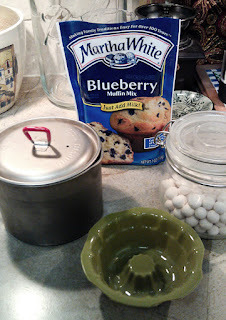 I picked up a pouch of Martha White Blueberry Muffin mix at our local grocery, and assembled all the required stuff in the kitchen. 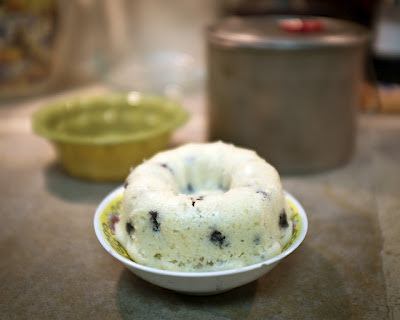 I went out looking for a large silicone muffin cup, and found a very small silicone bundt pan at the The Dollar Tree. It is a Cooking Concepts product, and it fit perfectly inside my MSR Titan Tea Kettle. Maybe a little too perfect, so I took scissors to it and scalloped the edges to assure steam escaped from underneath. 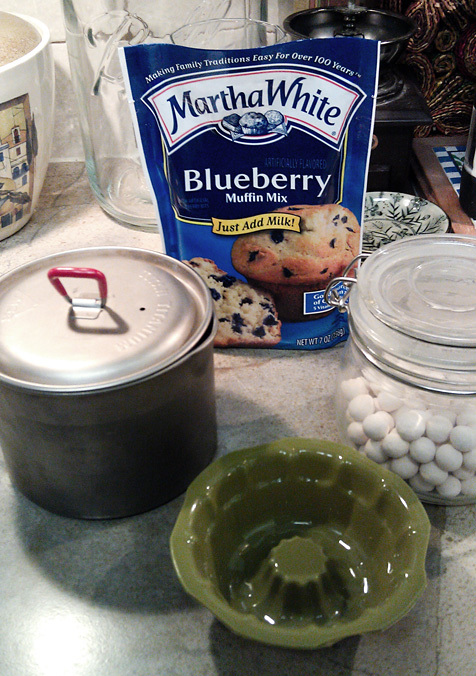 For stones, I raided Mary's pantry and her pie weights. 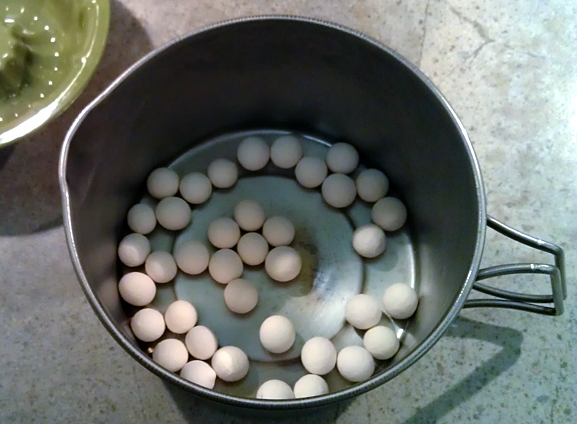 (ceramic marbles used to keep a crust flat when pre-cooking) I put the pie weights into the pot, and added about 1 inch of water. The package of muffin mix weighed 200 g. After a bit of trail and error, I arrived at quartering the recipe, and measured 50 g into a bowl. The directions call for 4 oz of milk for the full package, so I added 1 oz to the mix, stirred it well and poured it into the greased pan. I placed the bundt pan into the pot, put the pot on the stove over medium heat, waited for the water to boil, and started a timer for 10 mins. The directions say to bake it at 425 degrees for 14-17 minutes. Steam in a pan with the cover on is just a bit over 212 degrees, but I had no idea of what to expect. After ten minutes I stuck a toothpick in and it came out wet. So I gave it another 4 minutes, and the toothpick came out clean. Now, it wasn't browned, but it wasn't the least bit soggy as I feared it might. And the texture was as delicate and moist as you'd want a cake to be. It certainly uses a bit of fuel, but maybe an occasional treat like this, with the minimum effort it takes, is worth a bit of fuel.. I'm not going to be packing pie weights. I'll look for a few stones of appox the same size. I was concerned about running out of water with the pie weights, stones could add a bit more height, and room for more water. 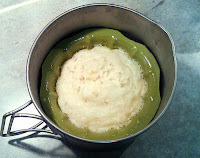 Baking Muffins - Ultralight Steam-Baked Style from NOLS on Vimeo. did you try making this with your backpacking stove? canister stove, so I wouldn't expect any difference in stove performance. If you're using an alcohol stove, it'd have to be capable of burning long enough to keep water boiling for ~14 minutes.